Former astronaut Scott Kelly is a dreamer. A retired U.S. Navy Captain, he’s best known for his “year in space,” the 342-day research project on the International Space Station (ISS) to study the health effects of long-term space flight. The NASA Twins Study on Scott and his identical twin brother Mark hit viral fame. I had the pleasure of seeing him speak at McCaw Hall in Seattle, where he discussed the core values that drive him. His underlying message: the importance of reaching, sometimes literally, for the stars. Life scientists can learn a lot from Scott. Synthetic biology is hard. It’s risky. Lab-grown organs, three-parent babies, data storage in DNA – some of it sounds borderline insane. There’s controversy. There’s politics. But at its core, synthetic biology is about taking inspiration from the mechanisms of nature and expanding it with technology, all to transform our world for the better. That means less disease, higher quality of life, and a healthier planet. If you think that sounds idealistic, you’re right – but that doesn’t mean it can’t be done. This field is full of no-nonsense idealists. Toxic waste-eating bacteria, cutting-edge vaccines, super-sensitive bionic limbs, plants redesigned to feed the world, sustainable spider silk fabric, molecules designed by nature and engineered into life-saving malaria drugs – these incredible innovations sound like they came straight out of a sci-fi short story anthology. But they’re happening, and it’s because of researchers who are willing to push the envelope. Most papers in the sciences discuss their “findings”. But synthetic biology isn’t just about finding things – it’s about creating them. The key is being willing to do what seems impossible. “When I was a kid growing up,” Scott says, “I was a really, really bad student. It wasn’t until he was 18 and read, on a whim, “The Right Stuff” by Tom Wolfe, that he found the inspiration he needed to apply himself in school. He buckled down, went on to graduate as an engineer in the Navy, made his way to Pensacola, FL to be a fighter pilot – he failed his first test, by the way, after crashing his F-14 Tomcat while landing on an aircraft carrier – and finally was accepted to the NASA space program in 1996. In December 1999, Scott found himself on the launch pad for his first journey into space, on a repair mission for the Hubble Space Telescope. It took 18 years, but he’d gone from the bottom of his class to the top of the world. Always challenging the status quo is what drove Scott through his career. If he had allowed himself to get comfortable, he’d probably still be in Florida, maybe flying cargo planes. He took a risk – retaking his Tomcat test even though he’d lose his Navy career if he failed the second time – and it paid off. The famed year-long mission ended in March 2016, but these lessons have stuck with him. “If we can do this, we can do anything. 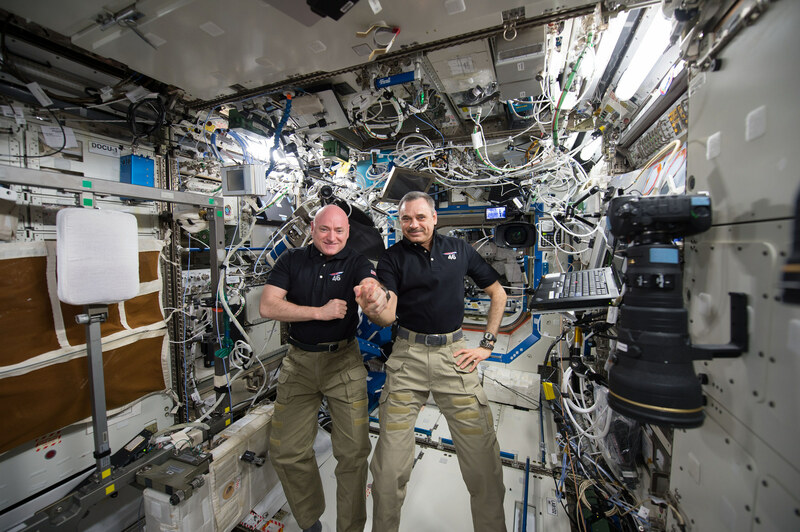 Scott Kelly and Russian counterpart Mikhail Kornienko together on the ISS. This perspective should certainly resonate with synthetic biologists. The field – a collaboration between plant and animal biologists, engineers, geneticists, computer scientists, and more – is ultimately about solving those high-level problems. It’s about doing the hard things, working together, challenging the status quo, and being persistent in the fight to better our world – even when it sounds impossible. You can contact Kevin to learn how you can sponsor more great content like this. Natalie is a researcher-turned-science-writer born and raised in Seattle. She received a Master's with Distinction in disease biology from the University of Leeds, UK. Apart from a specialization in virology, she has a special fascination with antibiotic resistance, allergies, prehistoric life, marine zoology, ecology, evolution, and bugs. She also has a soft spot for mental health and child development. A former interpretive guide at Yellowstone National Park, she is also a Science Communication Fellow at Pacific Science Center, where she uses a giant Plinko board to illustrate how herd immunity works. Raised on Zoobooks and PBS, Natalie hopes to work with the likes of Science, National Geographic, and NOVA, where she could ignite the same sense of wonder that drove her to become a scientist. She finds her spark in translating scientific research for the insatiably curious.